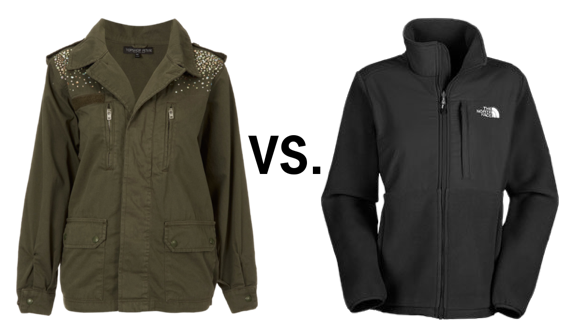 Topshop army jacket or a North Face fleece – which would you choose? Why do the British seem to ooze class out of their pores? We envision cup after cup of breakfast tea, her highness the Queen and her sensible brood, and, of course, the Brits’ impeccable taste in fashion. Even though it’s already April, one of the few things Ohio has in common with the U.K. is our unpredictable and miserably cold weather. Read on for tips on how to face the last (we hope) few days of cold with grace and poise – just like a true Brit. To talk fashion, we must first examine British terminology. For example, the word “smart” no longer means an individual with an adequate amount of intelligence, but one who is fashionably dressed, and causes multiple double-takes (even their words are classier). When someone hotter than hell (of model quality) walks by, he or she is considered “fit.” See? That is a culture with some serious eloquence. Want to look like a true Brit? It’s all about the layers, ladies. Photo from Vogue. Straight from the lips of the stereotypical British university students, Americans evoke images of Hollywood, obesity and fast food chains. Who are we to set cultural trends when they’ve been strutting along the sidewalk and runway alike? It’s time to play catch up. Lesson one: Don’t pretend to be fashionable if your life doesn’t revolve around the chicest jackets and trendiest boots for the next month. For these remaining cold weeks, focus on the warmth that infinity and similar thick solid scarves can bring. Think quilted patterns when perusing jackets for men, but always go with army green for the ladies. Pair a burgundy scarf with this moss green hue and you’d blend in amongst the masses trolling Oxford Street in search of the latest trends. As for the typical city folk stereotype, black will always be a quality staple, along with navy and gray. These basic colors can give some much needed contrast to an otherwise vibrant look, helping to ground it amongst us mere humans. Although North Face may be present on every college-aged person in the continental United States, no British students can be spotted with that familiar white emblem emblazoned on their chest. Unfortunately, that is purely an American fad (I own two). The variations of jacket design simply drip with refinement. Fur-trim, wooden button clasps, form fitting cuts and wool are desirable elements for any jacket adorned by a Brit. Look no further than a pea coat (props to those of you who smartly already own one). Now here comes my favorite part: the boots (in my opinion, footwear will always be the cornerstone of fashion and style). Yes, Americans do indeed don their boots when trekking outdoors, but Ugg barely exists across the pond (even Australians abstain from that nonsense). The importance Londoners place on their shoes is incredible, comparable to the attention we spend on our tans (wait, maybe that’s just a few of us). Rock your inner Brit in unique jackets and boots. Buh-bye, Sperry’s and neon cut-offs. Photo from Details. Men, it’s all about the side-zippered boots with distinctive coloring patterns (including the wingtip design or extreme point). Aldo is a decently priced venue to check out fashionable boots, but currently the ankle-cut boot is an all-out phenomenon. 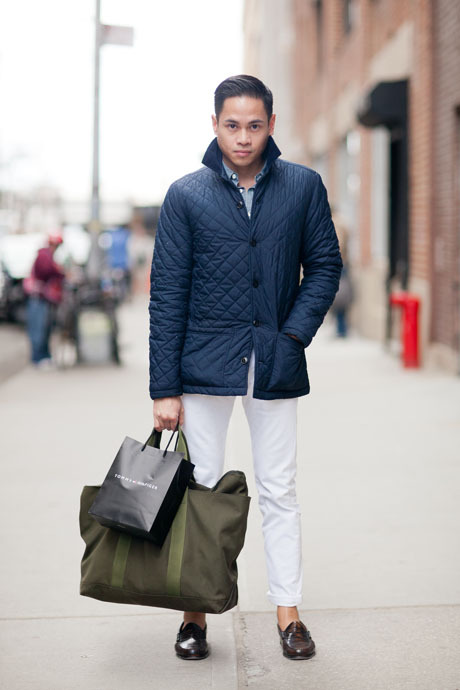 All shades are available and each can be seen on some of the most “smartly-dressed” guys this side of the catwalk. Light blue might just be worth a second look, guys. Women also indulge in the popular ankle-boot, but always adorned with studs or spikes. For the most fashion-forward of women, the stiletto is an ever-present element. Even classic tennis shoes are now uniformly worn with a wedge heel (is your mind blown?). The sheer chill of the blowing wind can’t keep these women from their preferred height. The next tip is a shout out to all the self-proclaimed hipsters who know the true value of a sturdy cardigan. Although for the masses, that doesn’t always mean it’s time to travel to the nearest thrift shop. Think cashmere, not elderly. It pays off to look put together. Button your cardigan or break out the argyle sweaters (a.k.a. jumpers – it’s a British thing). Bundle up against the elements, but leave the sweatshirt at home. Trust me, I’m doing you a favor. One final piece of fashion advice: Know which colors flatter and which don’t. This invariably depends on the individual, but you must keep in mind which shades are your friends and enemies. Don’t be afraid to try something fresh, but keep a base that can be easily returned to. Nothing’s worse than deciding to redesign yourself and realizing the previous “you” might have dressed better. Tell us about your favorite fashionable Brits (or you trying to channel your favorite fashionable Brits) in the comments or on Twitter!